Large Oceanfront Corner Pelican's Landing 3BR 2.5BA - Check For Specials!! This Condominium is OCEANFRONT and on the South Corner of the building with extra windows, a skylight and Free High Speed Internet Access! The condo is very bright, cheerful, and has a 'Caribbean Beach' theme and colors throughout. Professionally decorated just a few years ago, it has many special touches and amenities including TVs in the Living Room and all bedrooms, DVD player, wet bar, full-size washer and dryer, as well as one screened oceanfront porch off of Living Room and one open balcony off Master Bedroom. In January of 2015 all flooring was replaced with high-end large porcelain tile, the master bathroom was completely updated with tile shower and new vanity and the entire interior was completely re-painted. There is also an entrance screened porch for storing your beach chairs, floats, etc. This is a 'Smoke Free' condo. No Smoking is allowed inside the unit. Pets are NOT allowed. Linens are NOT included but may be rented for an additional $80 per week. Pelican's Landing is located on Shore Drive and only a short walk to the popular Ocean Annie's Beach Club and The Apache Fishing Pier. There are bike rentals nearby, two pools onsite, a children's playground, a putting green, barbecue grills, picnic table, pool lounge chairs, two elevators, and luggage carts for your convenience. GREAT LOCATION!! Barefoot Landing and Broadway At The Beach are both nearby as well as seafood restaurants, Super Wal Mart, Tanger Factory Outlet and the new Conway Bypass (will save you much driving time on check-in and check-out days). We also have two other oceanfront condos close by. The VRBO numbers are 62083 and 132861 so please check these out also! My wife and I purchased this condo in September of 2000. We live just a few miles from Pelican's Landing with our 3 young sons who love playing at the beach. We really liked the oceanfront, top floor, corner location of this condo because of the spectacular views and brightness of the interior. Beacause we live close by we are able to be personally involved on a regular basis with the upkeep and cleanliness of the property to make sure that our guests have a great vacation staying here. I am also a local REALTOR AND A SC REAL ESTATE LICENSEE and can offer my services if you are interested in a 2nd home yourself or perhaps you are interested in moving here permanently. Just let me know if I can assist you. The Shore Drive area is so convenient to everything including the Tanger Factory Outlet, Super Wal-Mart, the Myrtle Beach Mall and several other smaller shopping areas. Also, there are many fantastic restaurants close by including seafood, Italian & Japanese. 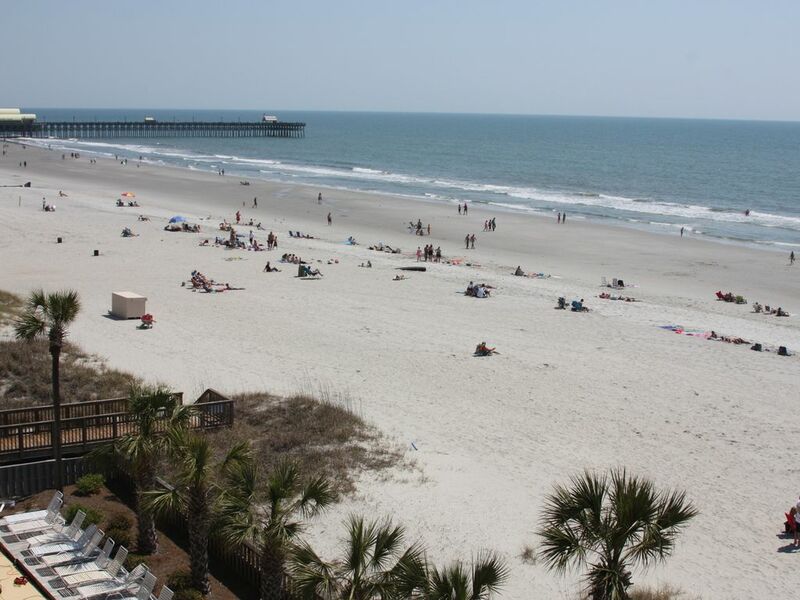 The Arcadian Shores Golf Course is also just a couple of miles away as well as the longest fishing pier in SC! We love the large screened porch off the living room and open master bedroom balcony overlooking the beach and ocean. Also, the extra windows and skylight are a big plus for not making you feel like you're staying in a 'tunnel.' The laundry room with the full size washer and dryer and the adjoining screened back porch are very helpful. Our condo is located on the top floor and on the corner at the end of the hallway so you rarely here any noise from other guests staying in the building. Televisions in living room and all bedrooms. (3) 1 screened, oceanfront porch off of living room; 1 open balcony off of master bedroom; 1 screened entrance porch. Iron & Ironing Board, Children's Playground, Linens are NOT included but can be rented.